Are you the kind of person who waits till the last second? You like procrastinating and can’t imagine doing anything on time? Well, what if we tell you that if you’re an early bird, you can win an extra $5,000? Guess what, now it’s here! 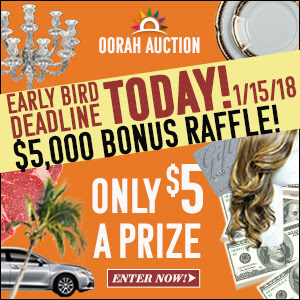 With your entry into the Oorah Auction before the early bird deadline, you’ll be automatically entered into the early bird $5,000 bonus raffle!